If you're a parent of a kid who's into video games then you've definitely had a conversation with them about Fortnite. You've probably experienced the game firsthand. On second thought, you're probably extremely tired of hearing about it. I know I am. We haven't even let my eight-year-old play it but it is still all he can talk about. He pulled one of those, "everyone in my class has Fortnite." Of course my wife and I laughed when said it. However, his teacher said that is actually probably true. 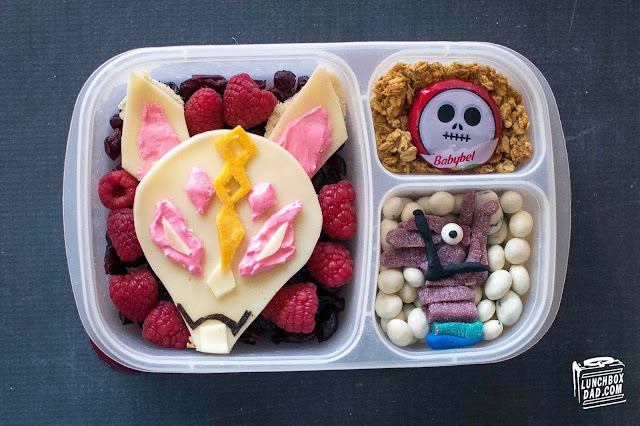 Anyway, he still doesn't have the game but I thought it would be fun to make him a Fortnite lunch. I'm going to be honest here, I have no idea about the skins, or characters, or pretty much anything else. But Google is my friend so I found these things in the game to put in the lunch. So if you want to make your own, the ingredients are below! 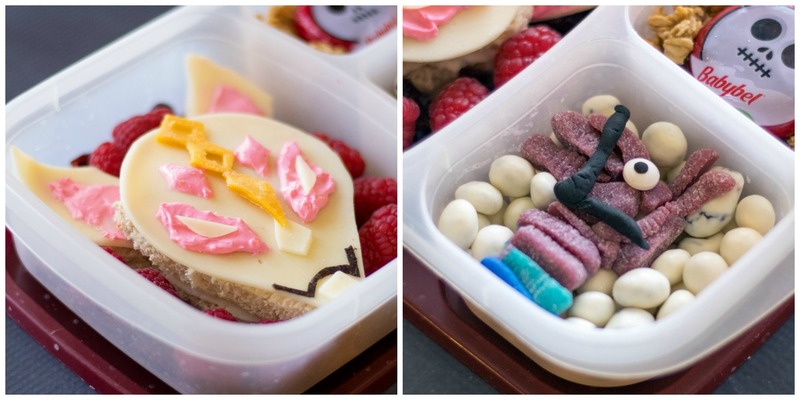 Ingredients: strawberry cream cheese, provolone cheese, turkey, sliced bread, dried mango, raspberries, nori (dried seaweed), Babybel cheese, granola, yogurt covered raisins, gummy candy, candy googly eye. 1. Make a sandwich using "Drift's" face shape. Drift is the guy with the mask in the main compartment. Put turkey in the middle and cheese on top. Use bread scraps to make the ears. Form strawberry cream cheese into the facial features. Cut nori for the mouth and dried mango for the facial decoration thingy down the middle. 2. I used a skeleton Babybel cheese for the skull character guy. If you can't find that, then you can just cut the top off the cheese and use nori to make the skull. 3. The llama piñata thing was pretty easy. Just use different colored gummy candy, cut it up, and stick it together like I did. Use a googly eye on top and then you're done! Click Here to Pin This Lunch!